Canonical, the maker of Ubuntu, has been fending off criticism from privacy advocates because the desktop search tool in recent versions of the operating system also searches the Internet. That means if you're searching your desktop for a file or application, you might also see results from Amazon or other websites. One person who dislikes Canonical's search tool is Micah Lee, a technologist at the Electronic Frontier Foundation who maintains the HTTPS Everywhere project and is CTO of the Freedom of the Press Foundation. Lee set up a website called "Fix Ubuntu," which provides instructions for disabling the Internet search tool. "If you're an Ubuntu user and you're using the default settings, each time you start typing in Dash (to open an application or search for a file on your computer), your search terms get sent to a variety of third parties, some of which advertise to you," the website says. To keep the balance between the integrity of our trademarks and the ability to use and promote Ubuntu, we’ve tried to define a reasonable Intellectual Property Policy. You can read the full policy at http://www.canonical.com/intellectual-property-policy. As you can see from our policy, to use the Ubuntu trademarks and Ubuntu word in a domain name would require approval from Canonical. Disclaimer: In case you are either 1) a complete idiot; or 2) a lawyer; or 3) both, please be aware that this site is not affiliated with or approved by Canonical Limited. 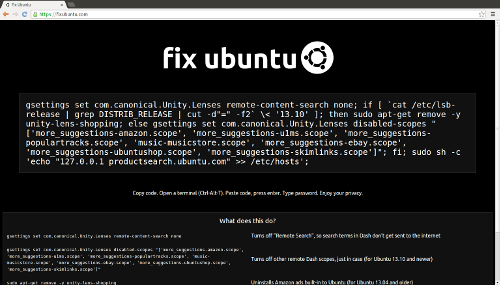 This site criticizes Canonical for certain privacy-invading features of Ubuntu and teaches users how to fix them. So, obviously, the site is not approved by Canonical. And our use of the trademarked term Ubuntu is plainly descriptive—it helps the public find this site and understand its message. His website still has the same domain name that includes the word "Ubuntu." Canonical doesn't seem to have a problem with other websites using the word Ubuntu in their domain names, such as "OMG! Ubuntu!," a news site that writes enthusiastically about the operating system. Canonical's registered trademark doesn't specifically mention domain names, but it claims broad rights over the word Ubuntu for use in "Telecommunication, communication, and broadcasting services provided online, via the Internet, or via other communications networks," and "transmission of information, data, text, images, graphics, sound and/or audio-visual material online, via the Internet or via other communications networks." We've contacted Canonical about the e-mail sent to Lee, but haven't heard back yet. While Ubuntu's code is open source and free to everyone, Canonical obviously hasn't given up its right to enforce its trademarks. Lee argued that the company's stance against his website "isn't very much in the spirit of open source," though. The code for Fixubuntu.com is also open source—Lee invited Canonical to "submit a patch" if it decides to help out "in a more productive way." The EFF has already sent a response to Canonical, in a letter from EFF Staff Attorney Daniel Nazer. "While we appreciate the polite tone of your letter, we must inform you that your request is not supported by trademark law and interferes with protected speech," the letter says. "The website criticizes Canonical Limited for certain features of Ubuntu that Mr. Lee believes undermine user privacy and teaches users how to fix these problems. It is well-settled that the First Amendment fully protects the use of trademarked terms and logos in non-commercial websites that criticize and comment upon corporations and products. Mr. Lee's site is a clear example of such protected speech. Neither Mr. Lee, nor any other member of the public, must seek your permission before engaging in such constitutionally protected expression." UPDATE: Canonical responded to Ars, providing the following statement: "To protect the Ubuntu brand, we need to ensure that wherever you see the Ubuntu logo, it’s an authentic part of the Ubuntu community. We have a public policy (http://www.canonical.com/intellectual-property-policy), which is open and accessible, and protects the brand. It states where you can freely use the Ubuntu brand and where a licence is needed. Trademark law requires us to protect our trademarks, so where needed we will always start a dialogue to ensure the trademarks are used properly to avoid confusion."